We will be honest with you, sage is not one of the easiest herbs to grow initially. But if you choose a hardy variety they will grow very well in the UK when they have become established. It's also important to decide exactly what you want from a sage plant, is it to use primarily as a herb for flavouring food or do you want it as an ornamental plant. Different uses require different varieties and their life expectancy will be quite different in the UK climate. Follow our simple advice however and it's relatively straightforward to grow sage as a herb or as a decorative plant. Deciding whether to grow herb from cuttings or from seeds is a relatively simple matter because the two methods are very different and have well defined advantages and disadvantages. 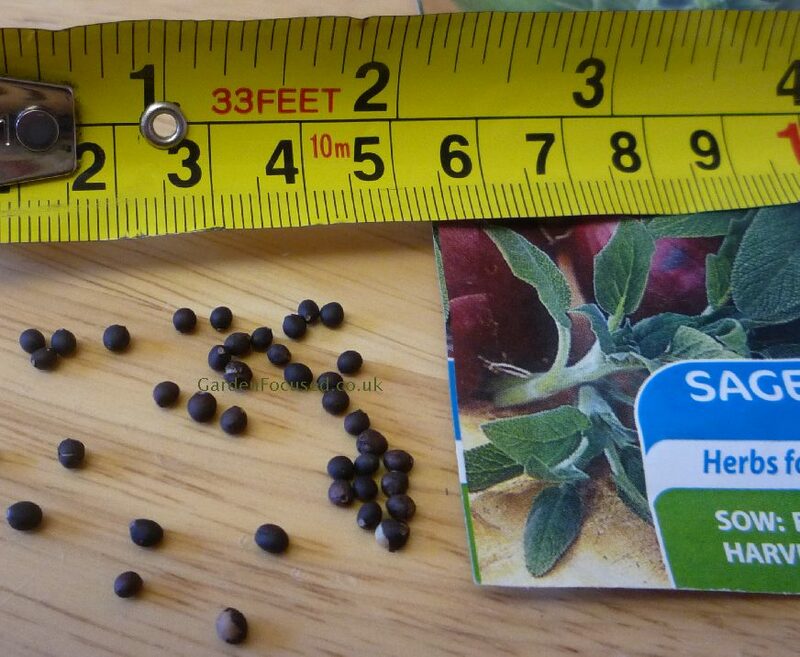 Growing sage from seed - the first obvious advantage to growing sage from seed is price. 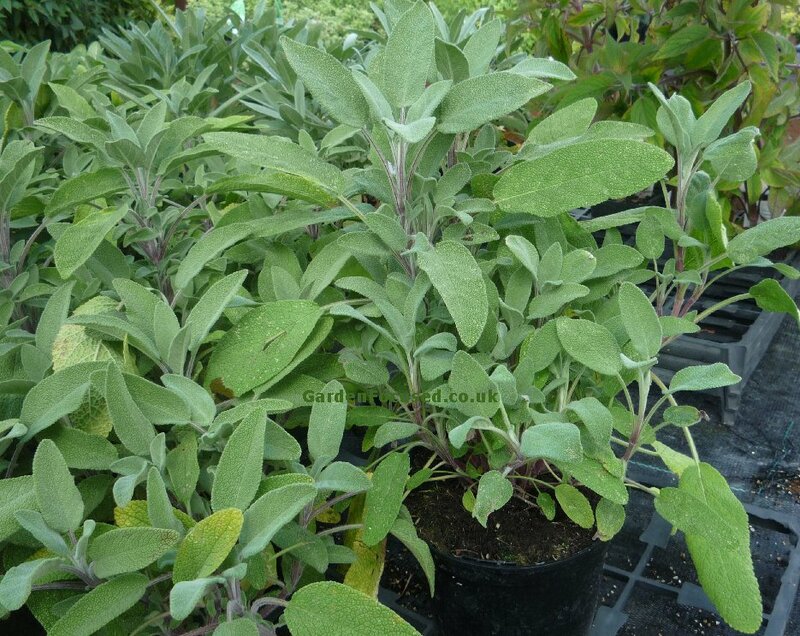 A pack of sage seeds (salvia officinalis) from Nickys Nursery for example costs just £1.25 for 70 seeds. You can expect every other seed to germinate and the seeds last for three years or more. You will also need a pot (reusable) and a small amount of multi-purpose for each plant but even so, the cost per plant is less than 20p, far cheaper than the average £2.25 for an established plant of the same variety. The only other advantage to growing sage from seed we can see is the fun and satisfaction factor. Without a doubt it's more satisfying to grow plants from seed rather let a nursery do the work for you. Another less obvious advantage to growing sage from seed is that the low cost means you can grow plants for friends at the same time almost for free. 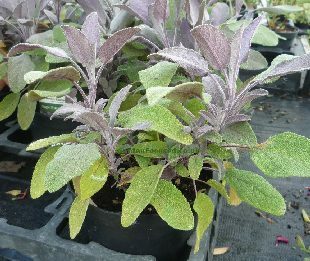 Growing sage from cuttings - almost all articles (online and in books) stress that growing sage from cuttings produces plants far quicker compared to growing them from seed. Investigate those claims in a little more detail however and the situation is not quite so clear. The best time to take cuttings from sage is around June time and of course you need a well established plant already to take cuttings from. From cuttings, the plants will have established themselves sufficiently in around a years time to begin harvesting leaves. A sage plant grown from seed (seeds sown in March) will be ready to begin harvest in about 18 months time. So yes, sage from cuttings is a quicker process compared to seed grown plants but not by a huge margin. If you already have an established sage plant, it's clear that taking cuttings is the quicker method but if you are starting from the point of buying a new sage plant and then propagating from that, the benefits are less obvious. As far as when to take sage cuttings there are two answers. For the absolute best chance of success the best time is around mid-June, however cuttings taken starting from the first week of May to early July stand almost as good a chance of success and will allow the leaves to be harvested earlier. Dates aside, another key requirement for taking sage cuttings is that the parent plant must have strongly growing young stems at least 10cm / 4in long, these are perfect for use as cuttings. 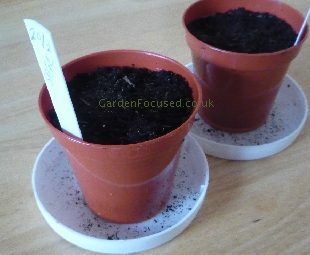 First, prepare to take the cuttings by filling an 8cm / 3in wide pot with multi-purpose compost. We've read in books and on the internet that mixtures of half sand and compost works better, and other combinations, however we doubt this from our experience. We also asked at the National Herb Centre how they propagated their herbs, including sage, and they use common multipurpose compost for the job. Place the pots in a shallow container of water for an hour or so to allow the compost to soak up water from the base. Now take a close look at the plant, select a vigorous and healthy stem which has no flowers at the end and cut it just below a leaf node. Use a sharp knife or pair of scissors to avoid crushing the stem. Snip away all the lower leaves to leave only three or four sets of leaves at the top of the cutting. Make a hole in the compost to a depth of about 5cm / 2in and insert the sage cutting into it. Firm the compost gently down around the stem. New sage cuttings will do better in a humid atmosphere so support a plastic bag over the pot with small twigs or similar. The supports should prevent the plastic bag from touching the leaves. Remove the plastic bag after a couple of weeks. Temperature is also important, try to keep the cuttings at about 70°F / 21°C (on a windowsill in a heated house will do fine). The cuttings should receive lots of light but not direct sunlight which can scorch the leaves. Sage grows well from seed but the plants do take a long time to reach the point where they can be harvested. We recommend sowing the seeds in the third week of March and this will allow you to harvest a few leaves towards the end of the summer. Normal harvesting of the leaves can then occur during the next year. To sow the seeds fill an 8cm / 3in pot with multi-purpose compost and place the pots in a shallow container of water to allow the water to be absorbed. Place three seeds per pot on the compost surface and then cover with about 1.5cm / ½in of compost. Gently firm the surface down. Place the pots in a warm place (about 70°F / 21°C ), there is no need for light at this stage. Germination normally takes 10 days or so depending on the temperature. As soon as the seedlings appear move the pots to a light and airy position which is not in direct sunlight. The temperature (a range of 60°F / 15° to 70°F / 21°C is fine) is not so important after germination but keep the plants away from any draughts. 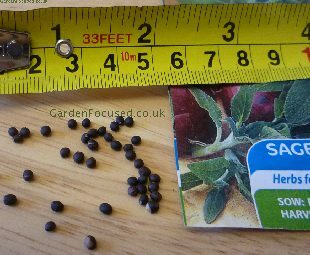 When the seedlings are 3cm /1in high choose the best growing one and cut the others off at soil level to leave only one plant per pot. 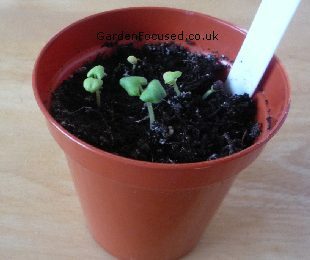 Both sage grown from seed and cuttings will need to hardened off before they can be planted outside. Start the process of in the last week of April by placing them outside in a sunny and protected position for a couple of hours. Over the next two weeks gradually increase the amount of time they spend outdoors each day but do not expose them to any late frost. Sage is very easy to grow when it is established and is almost always disease and pest free. It prefers to be treated on the harsh side, only watering when it becomes dry. The same goes for feeding, little and infrequent is best. You will need to decide if you want to grow your sage in large containers or directly in the soil. It does well in both but if you live in a cooler part of the UK container growing is probably best. In winter move the pot to a protected position away from harsh winds. Up against he outside walls of a heated house is ideal. Sage is a woody herb and if left to its own devices the lower half of the plant will stop producing leaves after two or three years leaving it looking a bit untidy. To postpone this inevitable process prune away the top third of the stems in mid spring time which will encourage new growth at the bottom of the plant. Pruning should only be done when the plant is two years and older. For both seed grown and cutting grown sage it's probably best only start normal harvesting in the second year. In late summer of the first year it will be possible to harvest a few leaves from strong growing plants. To harvest simply snip off a few leaves and use within a week or so. As a herb in stews, with meats and stuffing the leaves should chopped up finely and added direct. For sage tea the leaves can be roughly chopped. 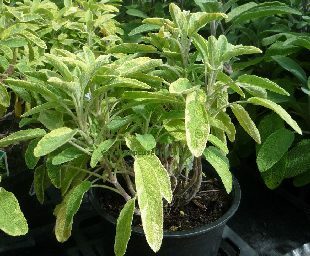 To preserve as dried sage, the leaves should be left to dry for two or three weeks and then crushed with your fingers. Dried sage is stronger in flavour compared to fresh sage so use about half the quantity. Stored in air tight jars out of the light, dried sage will last a couple of years. This is the best for most recipes, it has all the flavour and aroma expected of sage. It also has the benefit of being the most frost hardy of all the sage varieties. Although perfectly edible the flavour of this variety is very mild. It is however excellent if your want to add a splash to colour to salads. The plant itself is very attractive although should be treated as an annual because frosts can damage it. 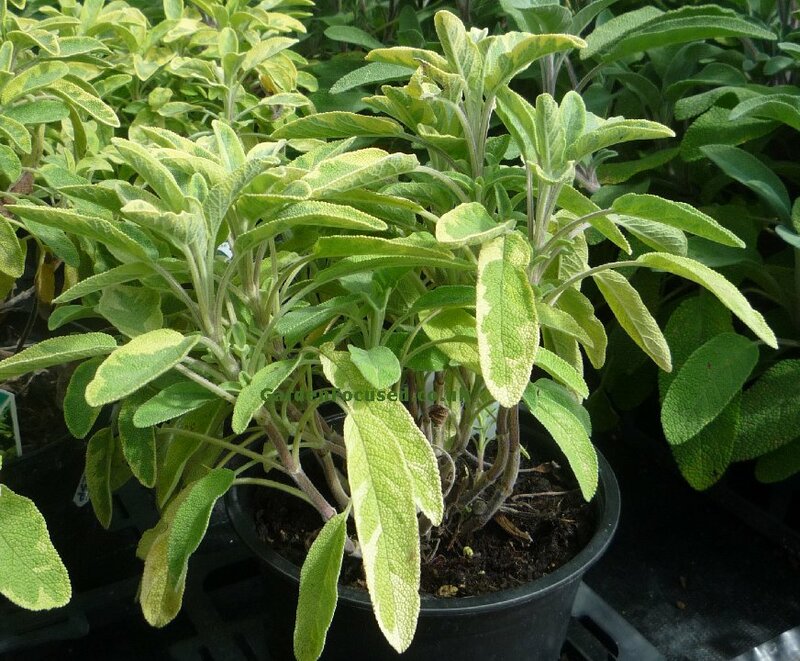 One of the best alternatives to common garden sage. Good taste as a herb in cooking, an attractive plant in its own right and it's frost hardy.